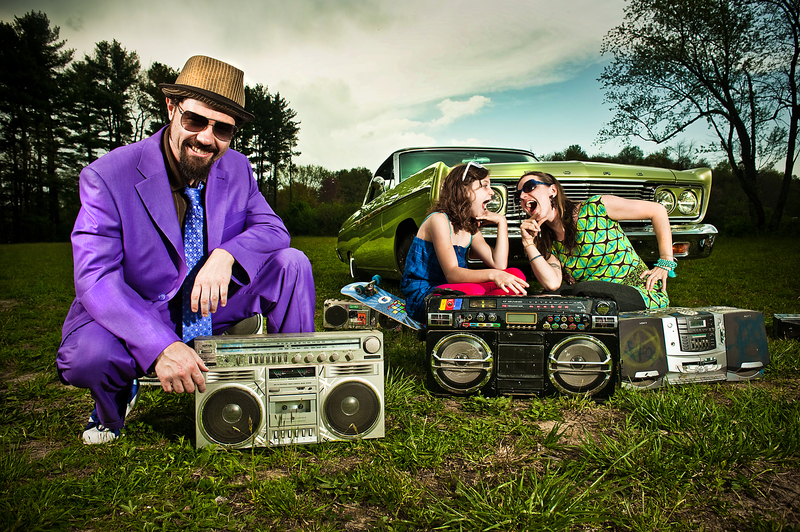 Interview: Secret Agent 23 Skidoo – It’s the Year of the Weird! June 24, 2014 marked the official release of Secret Agent 23 Skidoo‘s latest album, The Perfect Quirk, and his first book, Weirdo Calhoun and the Odd Men Out. In honor of these two releases, Skidoo is running a contest called Year of the Weird which encourages kids to get wildly creative by creating a destiny for an imaginary friend named Pickles and Weirdo Calhoun. Skidoo is a kid hop (kids + hip hop) virtuoso known for his wicked lyrical abilities. His rhymes flow with conviction and heart, consistently encouraging kids to embrace their unique qualities and be proud of who they are. In the following interview, Skidoo shares his thoughts on being weird and following your heart. As a parent and a writer, I found Skidoo’s thoughts to be extremely inspiring and I trust that you will too. KCG: Can you explain for my audience what the Year of the Weird is? Secret Agent 23 Skidoo: It is the celebration of the beautiful mutants we all are. It’s the resistance fight against Madison Avenue created mainstream normality blandness. It’s the belief that weird is not the exception to the rule, it’s the only reality, whether people want to admit it or not. It’s also the art explosion of my new CD, The Perfect Quirk, and my new book, Weirdo Calhoun and the Odd Men Out, with which I hope to spread wonderful weirdness across the globe. And it’s the name of a contest I’m holding where kids can win a GOLDEN TICKET that gives free access to any 23 Skidoo show ever, for life. Go to www.secretagent23skidoo.com for details…..
KCG: Why is this a special theme and how did you come up with it? The etymology of “weird” has its origin in the Old English word “wyrd”, which was a noun that means “fate or destiny”. I want to help kids understand that their weirdness is their destiny, and that they can ride it like a tidal wave of awesomeness to great spiritual riches. KCG: What does being weird/the perfect quirk mean to you? In your music, it seems to have always equated to being beautiful, celebrating who you are and that we are all different and special in our own way. Weird means interesting, authentic, unexpected. It means not basing how you act, look and create on what others are doing or expect from you. It’s good to be aware of other’s opinions, but not to let them dominate your natural self. KCG: Your consistent theme has been an advocate for accepting yourself and reinforcing the value in loving yourself, i.e. “Gotta Be Me,” from your album Easy, encourages kids to be their own best friend. How have you modeled/reinforced that for your daughter Saki (aka MC Fireworks)? I try to teach by action, and I live my life as a stubborn weirdo. I also have written about 5 songs for her that she gets up in front of crowds and repeats over and over, show to show, and has since she was five. So, a sort of positive brainwashing program, I suppose. KCG: Do you consider yourself weird (unique)? Indeed, and I was identified as a weirdo as far back as I can remember. The unique mix of my heart and intellect result in me having a different perspective on things pretty often. My own personal facet of the gem that is temporal existence. As a kid trying to fit in, it sucked, but as a professional artist trying to stand out, it’s perfect. KCG: Are there times where you still feel like an outsider or rebellious? In “Gotta Be You,” from your last release, Make Believers, I recall you saying — “a misfit always been different, that’s probably why I became a musician,” for example. Yup. I am naturally rebellious against any institution or establishment that seeks to normalize or homogenize the people that belong to it. Humans are naturally complex, quirky and unpredictable, and trying to treat them any other way only dilutes the beauty that we came here to experience. And from fashion choices to how I speak and carry myself, I continue to stand out. Sorta on purpose by now probably. KCG: I like how you express passion and ambition in the face of adversity with the lyrics “While they were making fun/ Cupid was shooting his arrow in my heart ’cause I love to rap/ Years later/ My songs are like thunderclaps…” (“3 Pointed Back,” The Perfect Quirk). What would you say to kids who want to be creative but might feel insecure because of peer pressure or just simply unsure how to engage that part of themselves? First off, don’t worry if your first attempts at creativity seem stupid or you feel you can’t do it…..That’s how every great artist started. I have notebooks full of rhymes I hated while I was writing them. Just try to have fun with it, and if you keep at it, eventually you’ll develop the skill to do something original and great. And if other people make fun of you or try to make you feel bad, just remember that later, you’ll have skills and an art that makes you feel amazing, and they’ll have nothing but the ability to make fun of things. Unless they become famous stand-up comics. Then I guess it works out for everyone! Listen to your heart. It’s hard to do, but if you learn how to feel the difference between not doing something because you’re afraid and not doing something because it’s not the right thing for you to do, that will help you find the path. Also, give things more than one chance. If you feel like you want to try something new, do it at least 3 times with heart before you give up on it. And remember that most kids want to be popular because they’re scared that they’re not worthy enough by being themselves, so they want to fit in with a group to seem bigger and stronger. Animals do it too. KCG: What helps you write/think creatively? Do you have rituals you follow that inspire your own writing? Yup. I get good sleep, meditate, sometimes chant mantras to Ganesha, the Hindu god of writing and the remover of obstacles and Saraswati, the goddess of playing music, flow and wisdom. And walking always help break through any writers block. KCG: What is the creative/writing process like for you – coming up with the topic for a rap, creating and then recording it? Coming up with it is vague, nebulous and magical. Writing it is structured, workday stuff, but if I do it right, I’m more energized than tired at the end of the day. Recording it is a little tense and emotional, but mindblowingly awesome and transformative. Like childbirth. KCG: What have you learned since your first album and how have you evolved as a kid hop artist? I keep experimenting with the complexity. I am constantly figuring out the difference between simplifying and dumbing down. And my stage show is getting WAY better! 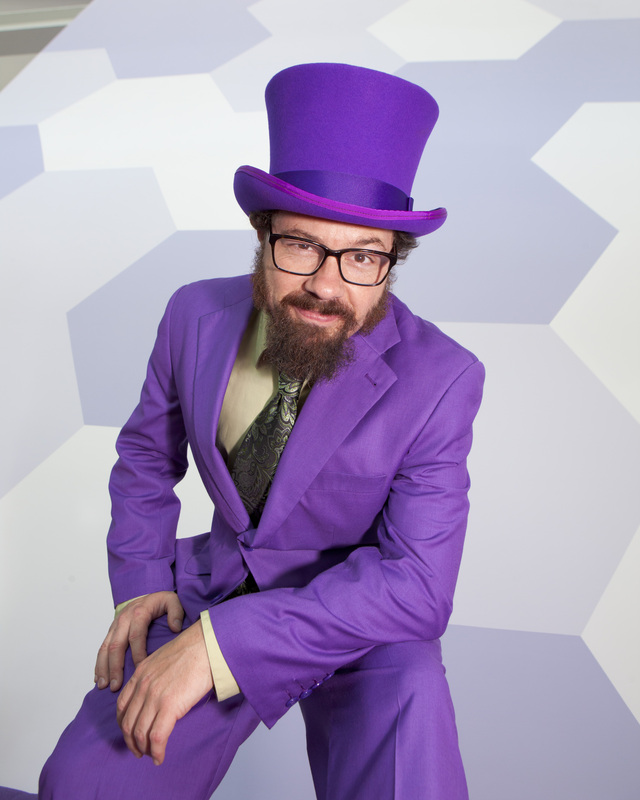 Purple suits, tophats, motown dance moves…We’re stepping it up! KCG: Your music and lyrics are tight and flow really well together. What is your work ethic like? Do you hold yourself to a higher standard with every new release? I think I did until Make Believers. Then I realized that it’s not a competition with myself, it’s just a challenge of channeling what I have in my head and heart into the final product clearly. I don’t need to be better than I was, I need to be as good as I am, ya dig? KCG: Why did you decide to write a book and not turn one of your existing songs into a book? I still might turn one of my songs into a book, “Last Dragon” perhaps, but I just like to write new stuff, and I wanted the story to be a bit longer than my songs are. I feel like in a song, the whole verse has to make sense, but in a book, every page has to make sense by itself. So I’m experimenting with a new form, and it’s fun. And it turned out awesome, so I’m stoked. KCG: From my daughter: What is it like to rap? It’s like shooting perfectly formed shapes out of your mouth that explode like fireworks and fall onto the crowd like nice cool rain on a hot day. Saki’s answer: It’s like a combination of yelling, singing and talking, but with more rhythm. KCG: What are the most frustrating and most inspiring parts of what you do? The most frustrating is that almost nobody knows about what we do, but everyone knows about the latest Disney movie. The most inspiring part is having a kid quote your lyrics back to you out of the blue, when you can tell they totally understand what you were thinking when you wrote them. KCG: There has always been a strong family tie-in with what you do. “Time Machine” is a beautiful letter to Saki. I especially love what you wrote to her in The Perfect Quirk’s liner notes: “I feel so lucky that even without a time machine, I still get to meet the future you.” Have you always written rhymes with Saki? Has she come up with her own creative endings to your stories? The Year of the Weird contest seems like such an awesome opportunity for families to experience together. Yeah, I’m her ghost writer, but it always starts with me asking her a lot of questions about whatever the topic is, so I can represent her viewpoint correctly. And she’s written one song completely by herself, called “Rocket Science“, which is on the album Science Fair. She doesn’t have the passion for writing that I have, but she’s incredibly good at it when she does it. 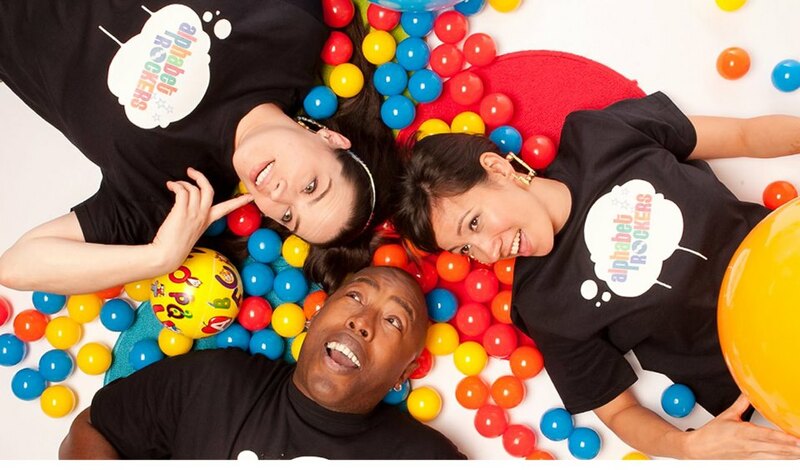 And yes, the contest is an amazing opportunity for families to collaborate on something creatively! Go do it! You can do anything you want….write a song, a story, a poem, make a sculpture, film a movie, do an interpretive dance, make a Tibetan sand painting…seriously, the weirder, the better. Get those boogie shoes ready everybody! Thanks to a successful Kickstarter campaign, Just Say Hi!, the latest release from Brady Rymer And The Little Band That Could, keeps the sweet sounds of rock n’ roll alive with a spirited set of what might be Rymer’s most personal songs to date. And by spirited, I mean full-on no stoppin’ this boppin’ blazing train of good times. Like the famous rock n’ roll icons of yesteryears (Springsteen, Mellencamp, Elvis, Little Richard, Jerry Lee Lewis, Ray Charles), Rymer has rhythm and blues running through his veins. Collectively, this talented troupe makes each song sound like a celebration. Music, specifically rock n’ roll, has played a major role in Rymer’s upbringing and he directly pays tribute to this genre in many of his songs, whether he’s singing about being raised on rock n’ roll music, playing “Stairway to Heaven” in his garage after school, or learning a piano rag with Grandma Helen. The joy of being with family and friends is interwoven throughout the album as well. “Get This Party Started,” cruises down memory lane with a young Rymer listening to Elvis in the backseat of his parents’ Oldsmobile, to the present day where a glance in the rear view mirror reveals his own children hoppin’ and boppin’ in the backseat to Beyoncè’s Single Ladies song. Just Say Hi! offers many opportunities for you to shake, rattle and roll. The songs we are spinning the most right now are the breezy, “I Spin” and “Getting Your Ya-Ya’s Out,” the perfect answer to burning off a sugar rush. Although, you might want to listen to the former before the latter. Despite it’s action-oriented name, “I Spin,” is a slower number that will help everyone begin to wind down. Brady with Moppit the monster. Other standout tracks include “Home,” a rhythmic dance song infused with comforting images that reinforce the saying “Home is where the heart is,” and “Tomorrow’s People,” a reggae tune featuring a supergroup of kindie musicians. Reminiscent of “We Are The World,” the voices of Laurie Berkner and Susie Lampert (The Laurie Berkner Band), Elizabeth Mitchell and her husband Daniel Little (You Are My Flower), and Drew Holloway and Jack Forman (Recess Monkey) highlight the power of music to effect change, as well as offer hope and gratitude. Rymer is a glowing light within the children’s genre. While there has always been a charismatic sound to his music, Just Say Hi! seems to take a more unfettered approach, providing insight into Rymer as an individual and a musician. Each song is delivered with fervency and infectious enthusiasm, or, as my 5-year-old said, “Brady sings his songs with a heart full of joy.” That just about sums it up! There is positively no way your family won’t be moved by the soul and sincerity found within this album. Just Say Hi! is available at Amazon and iTunes. Connect with Brady via Facebook and Twitter and make sure to check his official site for tour dates. A special nod also goes to Katie Gastley for the artwork on the album and creation of Moppit the friendly blue monster you see in the photos above. In addition to the preceding list, here are some other Father’s Day songs that you will absolutely enjoy. The WhirlyGigs – “Every Day In Every Way” – from the forthcoming Greetings from Cloud 9. This rag-timey jingle celebrates the love a Dad has for his daughter as it rings out, “you know I love ya girl, every way I can!” followed up with the promise of never-ending support. To download the song, enter ‘0’ into the price field. FREE DOWNLOAD through Father’s Day. Justin Roberts – “Dad Caught Stars” from Not Naptime. This one will always hold a special place in my heart as I recall my own childhood “catching stars” with my Dad on summer nights. Poignant and eloquent with a touch of magic. Frances England – “Daddy-O” from Fascinating Creatures – there’s no denying the grace and beauty found within Frances England’s music. “Daddy-O” is a beautiful, sentimental song that will melt your heart(s). Keep a tissue close by. Bill Harley – “Walk Around the Block” from The Best Candy in the Whole World. Humorous banter between a Dad and his son resulting in the delay of bedtime. Dad’s (and Mom’s) will have no problem relating to this song. Darryl Tookes and Joe Beck – “Daddy’s Always Here” from Precious Child – Love Songs & Lullabies. This video contains a collage of images featuring Dad’s with children of all ages. Set to a soothing lullaby, it’s a sentimental trip down memory lane. “I got a pillow and I don’t feel mellow.” Awww yeah, lookout! Those are (pillow) fightin’ words right there. “Pillowfort Pillowfight” is the first video from Secret Agent 23 Skidoo’s upcoming album, The Perfect Quirk. It’s crazytown in this video with Skidoo covered in stuffed animals rapping in the middle of a feather flying extravaganza! It’s pretty much every kids sleepover dream come true. 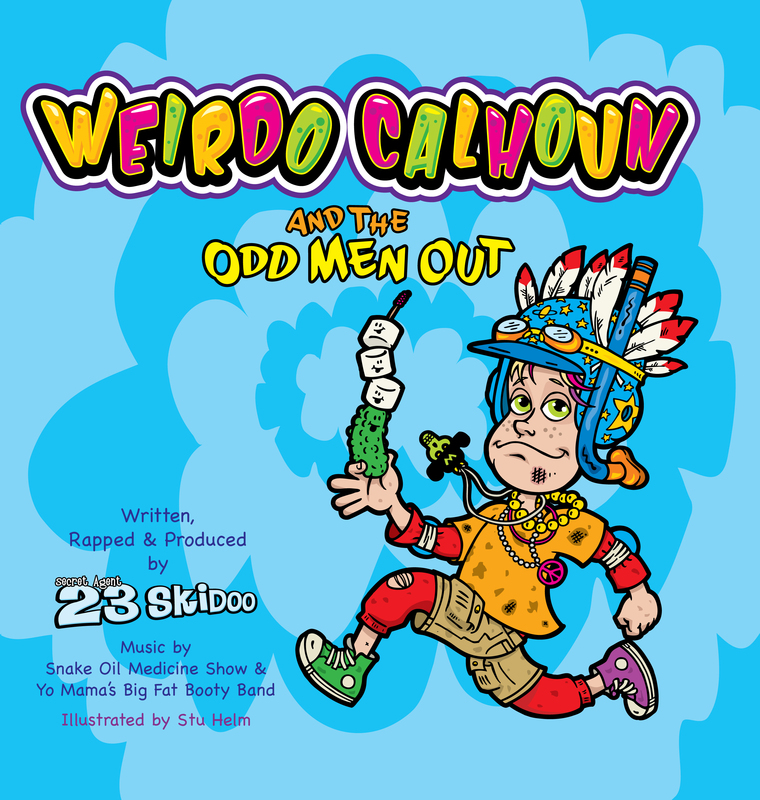 Pre-orders for “The Perfect Quirk” and Skidoo’s book “Weirdo Calhoun and the Odd Men Out” can be found on Skidoo’s site along with information on the Year of the Werid Contest.